The Malankara Syriac Church is also referred to as the Syrian Orthodox Church of India, or the Syriac Orthodox Church of India. The early history of this church is shrouded in obscurity. However, tradition assigns the founding of the Christian Church of India to the apostle Thomas, according to the apocryphal Acts of Judas Thomas, ascribed to the Edessene writer Bardesanes (154-222). St. Thomas is said to have preached the Gospel, and to have founded seven churches on the coast before going to the opposite side of the subcontinent. Later he traveled as far as Beijing. On his return, he was martyred in Mylapore near Madras. The place of his martyrdom and burial is preserved and today is a place of pilgrimage. This tradition was never seriously challenged until 1892, when Dr. Milne Rae put forward the theory that the Malankara Church was the product of the Nestorian missionary activity of the fifth and sixth centuries. Indeed, there were several colonizations from the Middle East to South India in the fourth and fifth centuries. Around 345, a group of Christians from Mesopotamia, under the leadership of Thomas of Kana, settled in Kerala wth their bishop. In 840, Mar Sabar Isho and Mar Peroz, two Nestorian bishops, arrived with more Syrian emigrants. Hospitable Hindu rulers welcomed them and gave them charters, as had been done previously, granting them a lofty place in their caste system. Their metropolitans were even given civil and ecclesiastical jurisdiction over the community. During its history, the Church has suffered owing to secessions from it to other churches. Some of the foreign bishops who came to Malabar were Nestorians. This accounts for the existence of the East Syrian Church in Trichur, which has a membership of over 10,000. When the Portuguese arrived in the sixteenth century, they were surprised to find over 100 churches, which they then sought to bring under Rome, In 1599, their archbishop convened a synod at Diamper, imposing Catholic doctrine and the supremacy of the pope. Because of canonical irregularities and abuses, this synod was never approved by Rome. In 1653, when they heard of the murder of Bishop Athella, who had been sent by the Patriarch of Antioch, some of the faithful assembled at the “leaning cross” in Mattachery Cochin and took an oath, renouncing Rome and returning to their original faith. They had no bishop, so they chose Thomas Pakalomattam to be their prelate, as Mar Thoma I. Conscious that he had no apostolic succession, Mar Thoma wrote to the Patriarch of Antioch to get his elevation regularized, and in 1655, Mar Gregorios came to consecrate Mar Thoma as bishop. Nine bishops with the title Mar Thoma, all members of the same family, presided over the Syrian Church in India until 1817. In 1813, a seminary was built at Kottayam for the education of the Syrian Christians. Three Anglican missionaries helped to staff the seminary without initially interfering in matters of faith. Later, other Anglican missionaries did not show the same ecumenical spirit, advocating “reforms” in matters of faith. This caused a deep split. 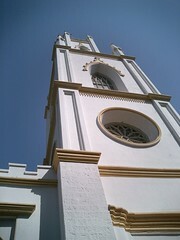 Some followed the missionaries and formed the “Church Missionary Society” Church in Travancore and Cochin, now a part of the Church of South India. Others, headed by their leader Abraham Malpan, revolted against such cherished beliefs and church practices as prayers for the departed and the intercession of Mary and the saints. They also encouraged priests to marry. These groups, first known as “Reformed Syrian Christians,” were the forerunners of the Mar Thoma Church, which is now in full communion with the Anglicans. In 1876, Patriarch Peter III of Antioch came to Malabar. He convened a synod at Mulanthuruthy where the faith of the Church was reaffirmed. He divided the church into seven dioceses and consecrated bishops for each. In 1910, Patriarch Abdullah visited the Malabar Church. Unfortunately, at this time a controversy arose with regard to matters of discipline and temporalities of the Church. This resulted in the excommunication of Mar Dionysius VI, the then Metropolitan of Malabar. This caused a division in the Church of Malabar, one side remaining loyal to the Patriarch of Antioch and the other declaring itself to be a totally independent church under a catholicos. Baselius Mar Thomas I, the first Catholicos of the independent group, was consecrated by Patirarch Abdul Messiah, who had been removed from the patriarchal throne by the Holy Synod of Antioch. Many attempts at reconciliation were made without success, including one by Lord Irwin, then the Viceroy of India. In 1957, Mar Ignatius Yacoub III became the Patriarch of Antioch, and in 1958, he recognized the Catholicos as an expression of his sincere desire for reconciliation. In 1964, after the death of the Catholicos, the Patriarch visited Malabar with a retinue of bishops and consecrated Mar Baselius Augen I as the Catholicos of the East. This brought a temporary end to the long division, but now the Church is again divided into two separate jurisdictions. Hope, however, still persists for the eventual reconciliation of the parties concerned. On July 26, 2002, His Beatitude Mar Baselius Thomas I was consecrated as Catholicos of India by Patriarch Ignatius Zakka I.